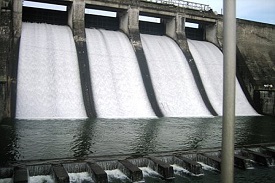 Malampuzha Dam was begun in 1949. Six years later it was completed and dedicated in 1955. The dam's capacity is 115.06 meters. The dam created the largest irrigation system in Kerala with a network of canals. This reservoir is in a majestic setting. Malampuzha, a small town located at the bottom of the Western Ghats in Palakkad district in Kerala is located around 10 km from the town of Palakkad. 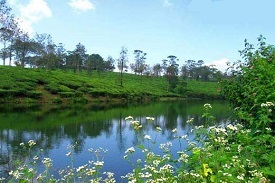 The region of Malampuzha is covered by greenery all over the place and the vegetation here thrives on the presence of the Malampuzha River, which is a tributary of Bharathapuzha that is Kerala’s longest river.There are two main regions of Malampuzha divided into highlands and the lowlands. The highlands mainly consist of hilly regions where the soil is not thick and is laterite while the lowland regions consist of midlands where the soil is thick with coconut, areca nut, cashew, pepper and rubber cultivation.The climate of the region is humid and the months from March to June are very hot especially in the western part of the district, compared to the eastern district. The region of Malampuzha receives rain in the second week of June because of the arrival of the South West Monsoon.Some of the main festivals celebrated here are the annual Chariot Festival at Viswanatha Temple that is held in the month of November and the annual festival at the Bhagvathy Temple in the month of March.The other main festivals are Kalpathi Ratholsavam, Vela at Manappulli Kavu, Nenmara Vallengy Vela and the Konganpada that is held at Chittur. These festivals include traditional dances and songs performed using different instruments and costumes. The primary language of the people in Malampuzha is Malayalam.Malampuzha Dam is among the most popular dams in Kerala and is also the largest reservoir in the state with a height of 6,066 feet. The Malampuzha Garden and Reservoir, which has a backdrop of forested hills of Western Ghats, are among the most popular attractions of Malampuzha.The major highlight of the garden is a large cement sculpture named Yakshi, which was created by the famous sculptor Kanayi Kunhiraman. The garden consists of a unique ropeway that allows visitors to move around the whole area. The park includes flowerbeds, pools, snake garden, aquariums and Japanese garden.Another popular amusement park is Fantasy Park, which is located 1.5 km from Malampuzha Dam. Lakkidi is located in the southern portion of India in the state of Kerala. It is many times referred to as the Gateway of the Wayanad district. This city is used as a jump off point in exploring the entire Wayanad region by countless people every year. The entire region is most notable for containing impressive mountain peaks, dense forests, and beautiful streams and other water features.This area gets an impressive amount of rain every year. In fact, Lakkidi has the second highest amount of annual rainfall in the world. So much water makes for a boaters paradise. With so many streams, lakes, and waterfalls, no wonder water lovers flock here.With so much landscape that remains ultimately untouched, it is no wonder that birdwatchers are drawn to this area. It is common to see such bird species as peacocks, cormorants, egrets, bulbuls, snipes, peafowl, and babblers. The natural landscape is also a draw for exotic animal lovers. The area is home to such wild animals as tigers, Asian elephants, sambars, leopards, cheetahs, sloth bears, and spotted deer.Trekking in the area is another favorite tourist activity. This undisturbed part of the country begs to be explored, and what better way to do so than by hiking and camping, all at the same time. Trekkers find themselves hiking through some of the most breathtaking lands in the world. Waterways, mountain peaks, forests, and even waterfalls are all readily explored when on a trek. Temples can be explored along the way as well. On 27th May 1498, Vasco Da Gama landed here with three vessels and 170 men. The story of a long and tumultuous socio-political relationship between India and Europe. If you travel 16 kms. north of Kozhikode by Kannur road, a small road near Tiruvangoor Health Centre will guide you to this beach of historical importance. A monument is here to commemorate the historical landing. An ancient temple on a hillock, facing the deep sea, is an added attraction.For the people of Kozhikode, this pleasant stretch of rock-studded beach is Kappakkadavu. 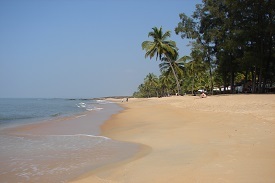 To the tourist it is one of the most charming of Kerala's beaches. Kappad finds mention in history and geography texts as the gateway to the Malabar Coast. the story of a long and tumultuous socio-political relationship between India and Europe.It was the spices and wealth of Malabar that first brought the Arabs, the Phoenicans, the Greeks, the Romans, the Portuguese, the Dutch and the English to Kerala. Kappad has witnessed many such landings. Kozhikode was then the most important trade centre of the Malabar region and the Zamorins who ruled this mighty land were powerful and shrewd. Though the Portuguese were welcomed in Kozhikode they were not too well encouraged or entertained for long by the Zamorins, which might be the reason they shifted their base to Kochi and Kollam towards south.Today only a little stone monument is left at the Kappad beach to speak of its great historic importance. On the rocks nearby is a temple believed to be 800 years old.To the tourist, this little seafaring town is a haven. The best route to Kappad is along the backwaters. Unspoilt and uncrowded, the picturesque backwaters of Kozhikode offer a bewitching experience. A ride down the backwaters through the Korappuzha river brings you to the beach. 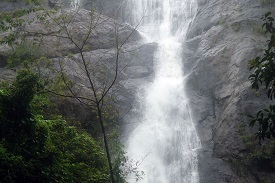 About 4 km from Aryankavu, Palaruvi is a slender thread of water hurtling down from a height of about 300 feet. Situated 75 km from Kollam town on Kollam-Shencottai road, this area was once a retreat for the Maharajas of Travancore. Palaruvi, which literally means 'stream of milk' collects in a little pool below, where visitors are allowed to take a dip. The remnants of yesteryear grandeur in the form of 'mandapams' and a stable can still be seen here. To get to the falls, one has to trek through narrow paths that run through the woods. Covered with dense tropical forests, the scenic beauty of the place enhanced by hills, valleys and cascades, is breathtaking. A sought-after picnic spot, the Palaruvi Falls is managed by the local community and is best visited after the summer months.Besides bathing in the delightful waterfall, trekking is the main activity at Palaruvi which attracts a lot of tourists.Palaruvi Trekking (7 am to 2 pm) - Covering 5 km, this trek to the top of the fall and back, covering streams, ancient caves, evergreen forests and reed breaks of the upper reaches will take about 3 hours. A minimum of 5 trekkers is required at the time of trekking.Kurishumala Trekking (7 am and 11 am) - A distance of 8 km will be covered during this six-hour trek which involves climbing up to the top of the fall, crossing streams, caves, evergreen forests and reed breaks of the upper reaches of the fall. Visit to the special habitat of the endemic and endangered Chenkurinji (Gluta travancorica) in its natural setting through Vilakkumaram-Rajacoupe up to the state border gives a glimpse of the neighbouring Tamil Nadu. A minimum of 5 trekkers is required at the time of trekking.Aryankavu Shastha Temple where the celebrated festival of Lord Ayyappa's Thirukalyanam takes place, Thenmala Ecotourism offering an array of products for tourists and the Courtallam Falls are nearby places of interest. Kumily is a quaint little town located on the border of two states - Kerala and Tamil Nadu. 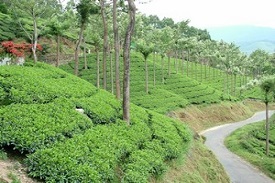 It is a little plantation town that is essentially famous for its strategic positioning, bang in the middle of all several tourist destinations in Kerala.Tourists flock to Kumily all through the year in order to take in the sheer beauty of its plantations and the rustic appeal of its old and charming markets. These markets are famous among the tourist community, with foreigners flocking to visit this town from various parts of the globe.Kumily is also located 6 km away from the town of Thekkady, which is yet another very popular tourist destination. With their long and winding plantation walks, diverse wildlife and something for the adventurous (including the tourist favorites of boating and trekking), Kumily and Thekkady offer tourists a wide variety of activities.You can mingle with the friendly locals, dig into traditional Kerala cuisine, soak in its rich and diverse culture & ride on elephants on your way through the plantations. For the adventurous at heart, Kumily offers boat cruises and trekking options, while the ones looking for a peaceful time can opt for rejuvenating massages in one of the cottages.To visit and experience Kerala hassle-free, view Best Kerala Tour Package.One can reach the quaint little town of Kumily through the larger town of Thekkady that lies near it. Getting to Kumily is quite easy, as the little town is quite well connected to other towns in the southern part of the country by road. The town of Thekkady lies six kilometers near Kumily, and buses are frequently available in this stretch of road.